Why a 3-Week Board & Train Program? Board & Train is a highly effective method of training your dog because it is done by a professional in a concentrated effort. Because the training is centered around a home environment it reflects a more true-to-life experience. From the pre-breakfast "migratory" walk, to feeding manners, obedience exercises, social and alone time and greeting guests, your dog is immersed in the practice of becoming a viable member of a functional pack. If you do not have the time, patience or expertise to work on your dog's behavior, a 3-week stay at Go Dog Go will give you and your dog a huge jump-start. Once your dog has learned the expected behaviors, you the owner will get a full "game plan" to continue and upkeep your dog's progress. All the repetition of teaching your dog is already done for you. An integral part of the 3-Week Board & Train experience is teaching your dog to respond to leadership. The trainer can show you how well your dog is able to accomplish this. But you as the owner must also prove your leadership abilities to your dog once they're back home. With my help you will come to understand what you need to do in order to take charge. My training philosophy is based on dog culture, so it is natural and sensible. A dog is naturally in tune with their leader. I will help you earn their loyalty through clarity and consistency. Why does training take 3 weeks? A 3-week time period is necessary in order for your dog to establish a trusting relationship with the trainer. In addition to a get-to-know-you period, obedience and manners take practice and repetition. The last thing you as an owner wants is a trainer who will try and push your dog's training experience too far, too fast. 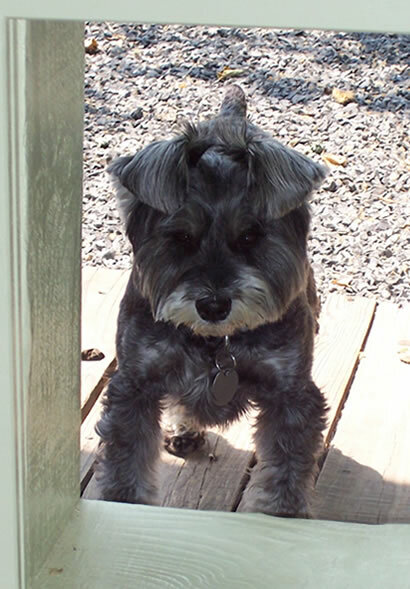 Daisy, a Miniature Schnauzer, looking in from the outside.